A sapphire (from the Latin sapphirus and Greek sappheiros, perhaps derived from the Hebrew word ספּיר, sapir) is a gemstone belonging to a family of gems that are varieties of the mineral corundum. Pure corundum is composed of aluminum oxide (Al2O3) and is colorless, but trace amounts of various elements (such as [iron]] or nickel) produce a range of colors, such as blue, green, yellow, orange, pink, purple, and red. The term sapphire is commonly used in referring to the blue variety, but nearly all the colorful gem-quality forms (except red) are classified as sapphires. The red variety (produced by the presence of chromium) is known as ruby. Synthetically produced sapphires are used for various applications. For instance, synthetic sapphire wafers are used as the faces of high-quality watches and as the substrates for semiconductor devices based on gallium nitride. Sapphires are part of the crown jewels of royalty and are a mark of wealth and luxury. Yet it needs to be remembered that these gemstones (among others) were recovered by the hard labor of miners working under difficult circumstances at the risk of their lives. In addition, wars have been fought and thefts have been committed in attempts to acquire these precious stones. Sapphires (as well as rubies) can be found in various rocks, mainly those of igneous or metamorphic origin (Sethi 1997). In addition, through the weathering of gem-bearing sedimentary rocks, these minerals are found in the form of "placer deposits" at streams and rivers. For instance, in the Mogok region of Myanmar (Burma), the mines are located in the alluvial valleys of rivers. Historically, most sapphires have been mined in Sri Lanka, Madagascar, and Myanmar. Australia leads the world in sapphire production, specifically from basalt-derived placer deposits in Queensland and New South Wales. Pakistan, Afghanistan, India, Tanzania, and Kenya also produce sapphires. In the United States, the state of Montana has produced sapphires from the Yogo Gulch deposit near Helena. Gem-grade sapphires and rubies are also found in and around Franklin, North Carolina. Several mines are open to the public. Exploring a pit mine can be a dangerous occupation. If appropriate safeguards are not used, the mine could collapse while the workers are underground. Also, as the workers dig deeper, air becomes increasingly scarce, leading to the possibility of suffocation. Sapphires have a hardness of 9.0 on the Mohs scale of mineral hardness. Among natural gems, only diamond is harder. Titanium and iron inclusions within the aluminum oxide result in various shades of blue sapphires. Some stones are not well saturated and show tones of gray. It is common to bake natural sapphires to enhance their color, luster, and general appearance. This may be done by heating the sapphires to temperatures of up to 1800 °C for several hours, or by heating them in an oven in a nitrogen-deficient atmosphere for seven days or more. Upon magnification, a sapphire may be seen to contain white, needle-like structures known as "silk." These needles are usually inclusions of the mineral rutile (titanium dioxide). If the needles are unbroken, it indicates that the stone was not heated. If the silk is not visible, then the stone was heated adequately. If the silk is partially broken, then a process known as low tube heat was used. Low tube heat is a process in which the rough stone is heated to 1300 °C for 20 to 30 minutes over charcoal. This takes out any gray or brown in the stone and improves color saturation. 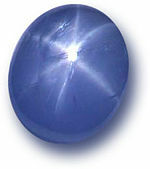 A star sapphire is a type of sapphire that exhibits a star-like pattern known as "asterism." The silk within the sapphire is arranged in a manner that produces a six-rayed or twelve-rayed star, when viewed with a single overhead light source (twelve-rayed stars are less common.) The world's largest and most famous star sapphire is the "Star of India," a blue stone that weighs about 563 carats. The value of a star sapphire depends not only on the carat weight of the stone but also the body color, visibility, and intensity of the star. Some sapphires are heat-treated or otherwise enhanced to improve their appearance and color, though some people object to such practices and prefer natural, untreated stones. Treated stones tend to be darker than untreated ones, and the treatment process causes changes to the internal structure that are generally easily detected. Sapphires that are not blue are referred to as "fancy sapphires." Purple sapphires, lower in price than blue ones, contain the trace element vanadium and come in a variety of shades. Yellow and green sapphires have traces of iron, which gives them their color. Pink sapphires have traces of chromium; the deeper the pink, the higher the value of the stone, as long as the color goes toward the red of rubies. Some "color-shift" sapphires are blue in outdoor light and purple in indoor lighting. Other stones may shift color from pink in daylight to greenish in fluorescent light. Some stones shift color well; others, only partially. White sapphires usually come out of the ground as light gray or brown and are then heated to make them clear; but in rare circumstances, they are found in a clear state. Synthetic sapphire crystals can be grown to form large, cylindrical crystal ingots ("boules"), up to many inches in diameter. 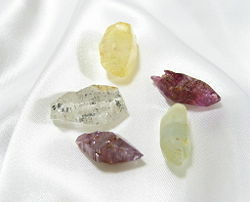 These may be cut into gemstones or used in a variety of other applications, as follows. The titanium-sapphire laser is popular because it provides the relatively rare ability to tune the laser wavelength in the red-to-near-infrared region of the electromagnetic spectrum. In this case, a synthetically produced sapphire crystal (containing titanium traces) is irradiated with intense light from a special lamp or another laser, to create stimulated emission. Pure sapphire ingots can be sliced into wafers and polished to form transparent crystal slices. Such slices are used as watch faces in high quality watches, as the material's exceptional hardness makes the face almost impossible to scratch. Sapphire ranks high on the Mohs scale of hardness, but owners of such watches should be careful to avoid abrasion against diamond jewelry, artificial stone, and simulated stone surfaces. Such surfaces often contain materials (including silicon carbide) that, like diamond, are harder than sapphire and capable of causing scratches (Scheel 2003). Wafers of single-crystal sapphire are also used in the semiconductor industry as a substrate for the growth of gallium nitride based devices. In some early cultures, the blue sapphire was thought to symbolize truth and sincerity, and to elicit divine favor. In ancient India, certain gems were thought to possess supernatural powers and were associated with different planets. For instance, blue sapphire was associated with Saturn (Wojtilla 1973), and yellow sapphire, with Jupiter. According to Rebbenu Bachya, the word sapir in the scriptural writing of Exodus 28:20 means "sapphire" and was the stone on the Ephod representing the tribe of Issachar. This interpretation, however, is disputed, as the biblical "sapphire" has been equated with lapis lazuli (Texas Natural Science Center 2006). Blue sapphires were first discovered in the Padar region of Kashmir in the 1880s. Kashmir stones were usually of exceptionally fine quality. Stones from Madagascar are often described as resembling Kashmir quality. ↑ Igneous rock is formed by the cooling of molten rock (magma). ↑ Metamorphic rock is the result of transformation of a pre-existing rock type, by the effects of temperature and pressure within the Earth. ↑ In mineralogy, an "inclusion" is any material trapped within a mineral during its formation. ↑ Stimulated emission is the process by which matter, when perturbed by a photon, may lose energy, producing another photon with the same phase, frequency, and direction of travel as the original. The process can be thought of as optical amplification, and it forms the basis of the laser and maser. ↑ Sapphire – Coyle Wholesale Jewelers, 1999. Retrieved March 19, 2007. Sethi, Parvinder S. "Nature’s Perfect Imperfections." The World & I (Dec. 1997): 186. Online version accessible by subscription. Wojtilla, G. "Indian precious stones in the ancient East and West." Acta Orientakia (Budapest) 27 (2): 211-224. This page was last modified on 19 August 2015, at 16:36.